Set ud på en seks dages rundtur i Argentinas fantastiske Patagonia-region med en række overnatningsbudgetter at vælge imellem. Denne multiday udflugt omfatter guidede eventyr som en bådtur til Perito Moreno Glacier i Los Glaciares National Park, samt rigelig tid til at udforske alene. 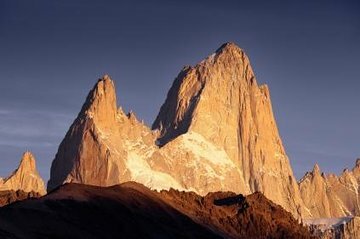 Gå på en dagstur på Mt Fitz Roy, hvis du føler dig til det, eller bare bask i den naturskønne skønhed El Chaltem. Lær om patagonian kultur i hele din rejse, som begynder og slutter i El Calafate. Valg af fire typer indkvartering giver dig mulighed for at passe denne tur til din stil og dit budget! Perfect for the independent traveler. Made organising our time in patagonia quick and easy. The tour company provided pickup and orientation, this was extremely helpful and the team were really friendly. The accommodation in El Calafate would blow you away. I saw what I wanted to see in the short amount of time I had. The hotels were good, the food was good. The only issue that came up was the long wait after checking out of El Chelten, so I had to pay to go back to El Calafate earlier in the day than 7pm. It would have been nice to have the option to return earlier without the extra expense. So a previous reviewer said that this tour is for the Independent Traveler. I 100 agree with him. The tour package basically gives you a ride to and from El Chalten and you're on your own once you get there. Get to know El Calafate and where the bus station is the day before because you leave for El Chalten super early in the morning. Not a great time to get lost. And, you get back in the evening, so you should know your way back to your lodging. This is where it gets bad, for me. So I booked an Inn. I couldn't find it. Fortunately, I was traveling with a friend who I met the day before at the airport. She was staying at the Hostel. I decided to walk with her to the hostel and call my Inn once I got there. Well....after a few phone calls made by the good people at the Hostel and put on hold for awhile, I found out the Inn is closed and have been closed for a couple months. Tried to call the travel company with no luck. Mind you, this was Saturday. So I just decided to pay for 2 nights at the hostel. It cost me around 20/night for a 4 bed dorm. And I requested to room with my new friend. The itinerary said that I could stay at the La Aldea or something similar. It was nice if I had gotten a hold of someone to tell me where that something similar was. Please make sure your info is updated. It was quite disorienting. El Chalten is small enough that you can figure out what you want to do within a couple hours, more or less. Depending on you, the traveler. It was a little disorienting to be dropped off at the bus station and you're on your own. No one to meet you or direct you. The town is small enough that it was easy to find my lodging. The personnel at the bus station were not really helpful. So just start walking into town. There's only one way in, one way out. Unless you want to start going over mountains and streams. This is where I take off one star. The views, trails, fresh air, the other travelers....make the other 4 stars. I mean.....the view itself is inspiring!!! I'm the type of traveler who gets a room to have a safe, warm, and dry place to sleep. Oh! And a shower. We were so blessed to have 2 days of wonderful weather. Our last half day was super cold and windy and some rain, but it cleared out towards the afternoon. Just the sort of weather I expect in the Fall time Went there end of March. If you need trail info, the bus stops at a Ranger Station? before getting into town. Get as much info as you can there. It is also a mandatory stop. We got the rest of our info at the Hostel. Lots of laundry places to get your stuff fresh and clean. Exactly what we expected - airport transfers to and from the towns. Transportation to the glacier park and between calafate and el chalten. Decent hostels. Overall it saved us the headache of booking all of these ourselves, and all of the guides and transportation people were friendly and helpful. The trip itself was spectacular and would highly recommend it! I was traveling solo during this trip and thus paid higher rates, but that said I generally still believe the tour was pretty expensive compared to quality of the hotel and travel arrangements. I believe more economical rates could be found locally. The hotels, we booked 4 to 5 star hotels, were far below the standard. The hotel in El Calafate was OK but was 3 Stars, the hotel in El Chalten was far below the standard, and was, looking at the rating close to 3 but far from 4. We will not book via Viator again, they can not guarantee the hotel which was booked, and book other hotels which are on the "same level", which we feel is not the case. We enjoyed the trip, all people we met were great and helpful, but the hotels were not what we booked. It did not interfere with our overal enjoyment of the entire trip, but it was anoying, spending money and not receiving for what you paid.